Hello everyone and welcome to this post where we talk about Movavi Screen Capture Studio. 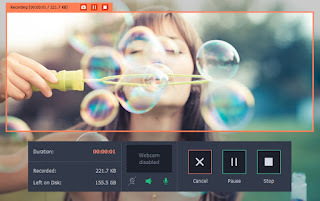 Movavi Screen Capture Studio is a simple tool that allows you to screen capture images, videos, record games while you play, and even record videos online from web pages like Youtube with ease. The movavi tool is one of the best free screen recording software with a whopping 7 days free trial after which you are required to pay an affordable fee which is by far worth it. ==>1. It allows you to either choose an area to be recorded by using your mouse to draw it out or use the inbuilt preset feature to automatically highlight the video in the page. ==>2. It allows you to select the audio source which you want to record. E.g system audio, microphone or other devices. ==>4. With it, you can edit video and add some effects or cut out areas you don't need. ==>5. With it, you can easily adjust the audio level for each audio that you are recording. ==>6. It lets you set the start and stop time. So you don't have to give it all the attention in the world. ==>7. Words or keys typed on the keyboard while recording, can also be recorded. This is a great feature especially when trying to teach the viewer some set of tricks. To use movavi, you need to first download the software onto your device (windows computer, mac, android and iOS). You can check above for list of supported devices. After downloading, installing and opening the software, you will see a red box which covers the area you intend to record. This can be adjusted to fullscreen or by custom. Aside the red box, you will be met with some set of buttons under which gives you the ability to set up and do your screen recording. You can use that to make any necessary setup before recording. After recording, you can also edit to add effects or cut out unwanted sections or parts of the recording. You get up to 7 days free trial after which you can still use the tool but the videos/images will be watermarked. Its cheap and affordable compared to others. Editing videos has never been so easy. That's all on Movavi Screen Capture Studio a tool that can help you capture video from screen. For more info, you can check out their website here.